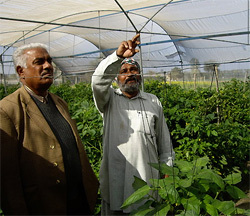 The South Asia office was established in 2006 on the campus of the International Crops Research Institute for the Semi-Arid Tropics (ICRISAT) near Hyderabad, India. South Asia is home to a large proportion of the world’s poor, most of whom live in rural areas. As poverty increases, diets often become less diverse and micronutrient malnutrition can increase as cheap starchy staples replace vegetables in diets. 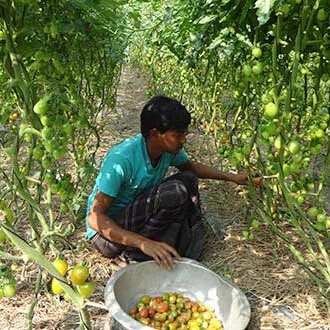 Vegetable production in South Asia has been virtually static for the last two decades and per capita availability has declined as populations have increased. Despite India’s rapid economic growth, there are still 300 million people living below the poverty line and 75% of the poor live in rural areas. Per capita consumption of vegetables in India is only about 86 g/day, compared with FAO’s recommendation of 200 g/day. To improve the nutrition of rural families, vegetables production must be increased and better integrated into the region’s predominantly cereal-based farming systems. At the same time, the increasing demand for food from the urban poor living in megacities needs to be satisfied.